Well done. I hope the cross of St.George doesn't signify anything naughty. The Auster is a really good looking plane, and the Dornier, though ugly, is very well-made. The canopy detail is very cleverly done. David, not sure what the St George cross is doing there, but it said decal 18 goes there, and so that's where it is. Tom, the Dornier isn't pretty, agreed! 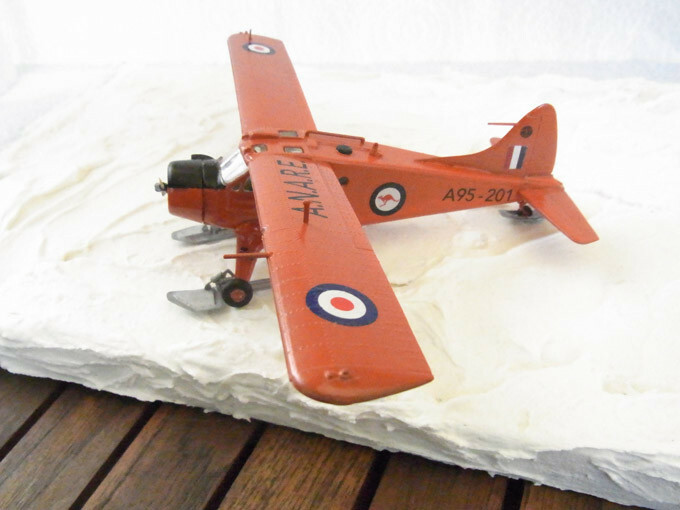 But I do love that plucky little Auster! Must have been cold in that cockpit. I like the Pfeil and for that matter many of the other interesting aircraft the Germans turned out towards the end of the war. Here you are Jamie, a scratch build challenge. Could be made out of hubcaps, washing up bottles etc. Interesting plane, Jamie. I'm scratching my head thinking about how the rudder works positioned just in front of those props. The rear prop's thrust is backwards as is the front so it wouldn't interfere with the rudder. Yes, of course, but it seems as the rudder is turned, it would deflect more air to one side of the rear prop than the other side. Maybe no big deal, but I'm thinking there could be turbulence and a resulting imbalance for the prop. On interesting thing about the rear prop is the inclusion of the lower tail hanging under the fuselage. Its purpose was partly as protection for the prop, especially during rough landings on poor quality runways, so the "undertail" hit the ground before the prop did. We're heading back to Antarctica, chaps. 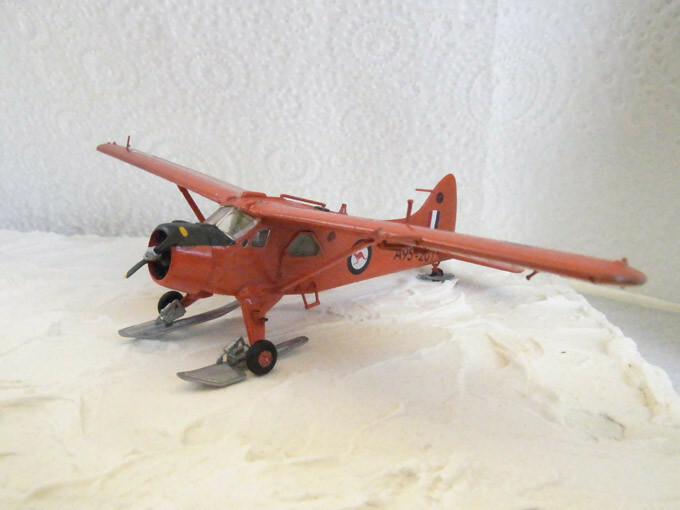 I had intended to build this plane with floats and pop it onto an Alaskan lake diorama, but then I came across a snippet saying the Australian Government's Antarctic Division had bought five of these DHC2 Beavers in the 1950s, and so I changed my mind, built it with skis attached and painted it bright orange, just like my other Antarctic plane, the Auster. And so here it is, a De Havilland Canada DHC2 Beaver, yet another STOL (short takeoff and landing) specialist from this excellent Canadian company. The kit is a very nice one in 1/72 scale, by Airfix, which means almost everything fitted nicely together without much fuss. 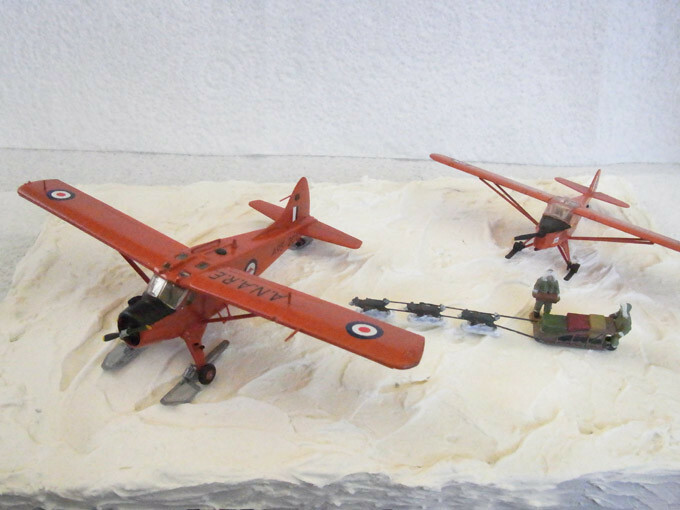 Sadly, the five Antarctic Beavers, while providing good service from 1955-1964 in sometimes horrendous conditions, were not deemed a success, and were replaced with helicopters and other aircraft. Two Beavers were destroyed on the ground during one ferocious blizzard at Mawson base, and another one was damaged beyond repair a year later. This kit isn't strictly accurate. It's actually for a US Army version of the Beaver, but fortunately I am not bothered in the least by concerns about nitpicking accuracy. The four windows inset into the cabin roof, for example, weren't correct, but I decided not to fill them in. I left the windows there to toss the nitpickers a bone to chew on. However, I am rather pleased with my home-made decals, especially the ones with white bits. White doesn't print as a colour on laser or inkjet printers, so what you have to do is cut out a white background on 'white-backed' decal paper, then apply to the model and let dry thoroughly. Then you have to lay the coloured bits on top of the white background as a second decal on top. There's magic stuff for applying decals called Microsol, which kind of dissolves decals in place so they look painted onto the surface, so it wasn't that hard to do. I think I like planes with skis as much as I like planes with floaties. 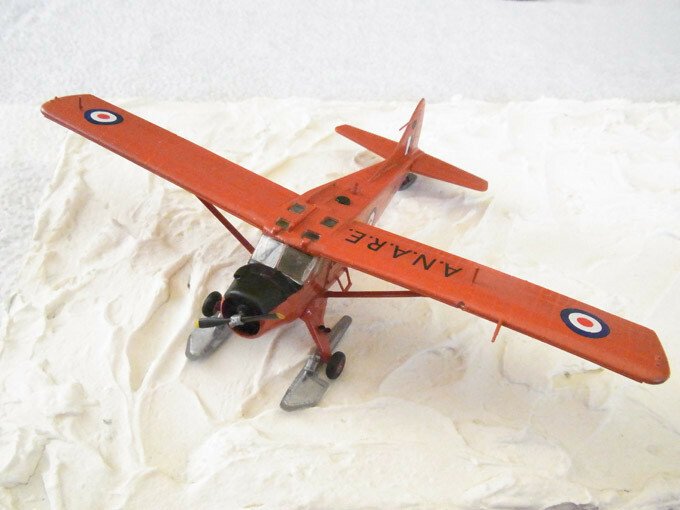 And finally, here's my Beaver with my Auster. In 1955 both planes served at the same time at the same base, so this is almost historically correct. However the dogsled team is from my Ford Trimotor kit, and I only included it because I love my dogsled team! The Beaver is the frosting on the cake ! Another great job on a very nice looking plane. The proportions look really good on the beaver. 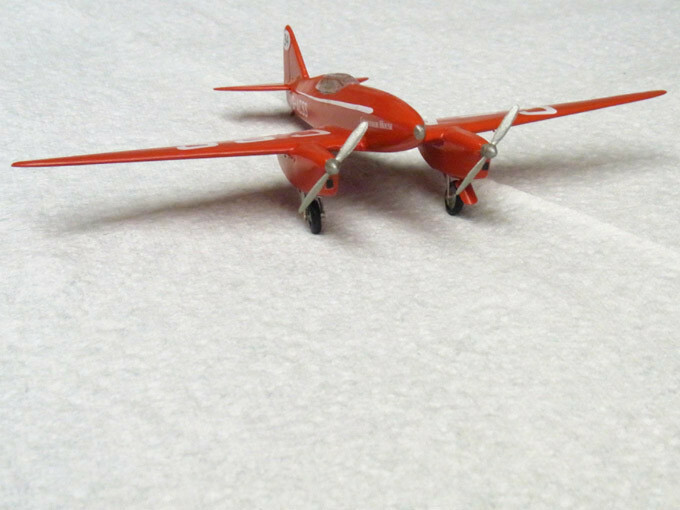 Really like this one, very pleasant looking plane and a great build. 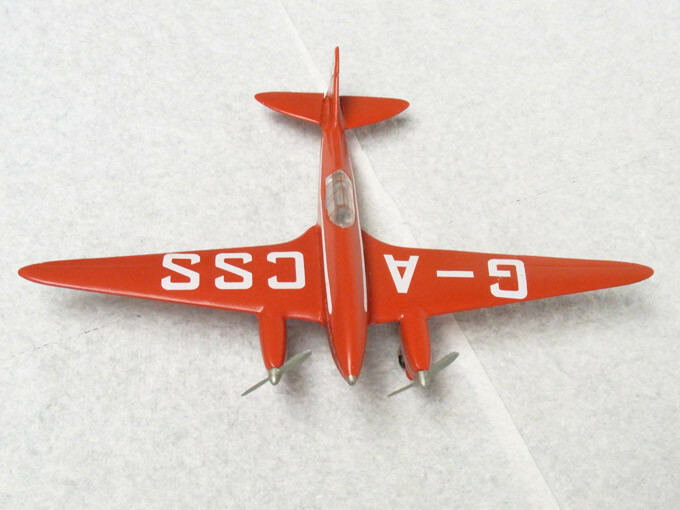 I'm not quite turning full circle, but I am planning to build nicer versions of some favourite planes which I built two years ago, when I first started this model-building caper. This time round it's my all-time-favourite plane, the Beechcraft Staggerwing, otherwise known as the Beech 17. 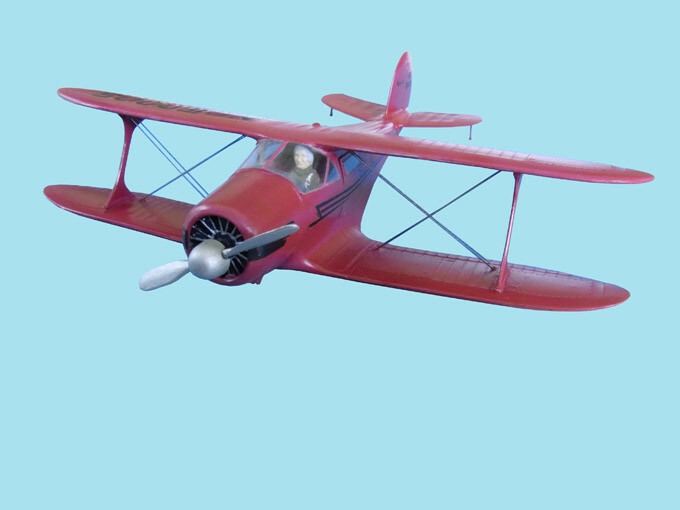 This model is in 1/48 scale, and as I love the way the plane looks with its wheels up, that's how I built it and am going to display it. And here it is "flying" under my bookshelves. I do like 1/48 scale, much better level of detail than 1/72. I've tried to make it look like an illustration rather than a photo, using a couple of the filters that come with Photoshop. Last edited by Ozmac on Fri Aug 28, 2015 6:59 pm, edited 1 time in total. Very nice! Charming little plane, really nicely built. No denying how appealing this one is Jamie. I can see why it's a favorite. 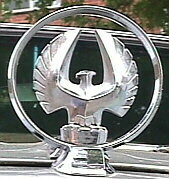 Any background on why the wings are staggered? Yes, the wings were staggered to provide a superb view from the cockpit. 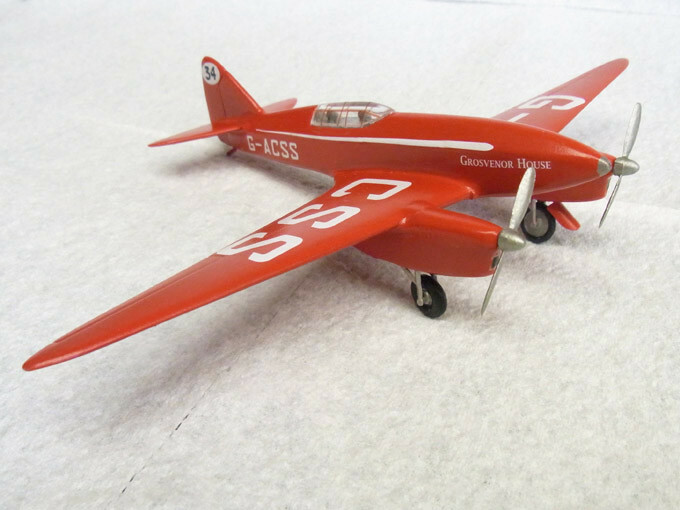 This was the "executive jet" of its day, a very fast plane for its time which won several major long-distance races (including two ladies taking out the Bendix Cup in 1936, and again in 1938). It was the preferred plane for oil industry executives in the 1930s. Capable of landing in open fields, it had a fast cruising speed, plus great views for passengers and, of course, the pilot. We're going crop dusting, folks. Quite a back-story to this one, but the short version is that I've just finished reading a biography of Australia's most famous aviator, Sir Charles Kingsford Smith (it's written very well by a New Zealander, Ian Mackersey). In it he mentioned that "Smithy" was a great pilot but a lousy businessman, hopeless with money (an amazing womaniser ! ), and probably would never have been able to put together any of the business deals that his "co-pilot" Charles Ulm organised, which made possible his most famous feat of being the first to fly across the Pacific, plus several other pioneering long-distance flights. 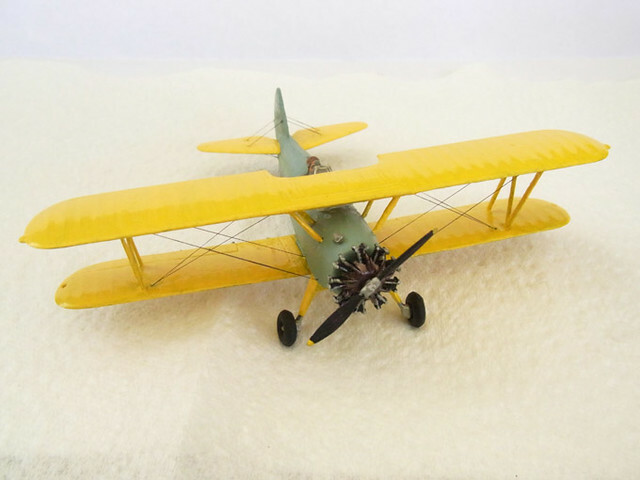 Mackersey mentioned that Smithy just loved flying, and if he hadn't got lucky and met Ulm – and lived a life of obscurity rather than fame - he would have ended up a bush pilot doing things like cropdusting. 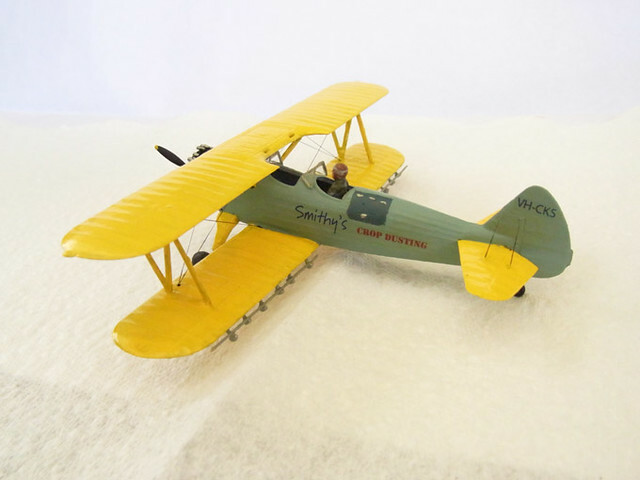 At the time I read that comment, I was also thinking of building the Stearman Kaydet biplane, as part of my series of famous pilot trainer aircraft. In the notes on the Kaydet, it mentioned that so many were made that, after WWII ended, lots of them were sold to civilian pilots, and quite a few were turned into crop dusters. And so that was the inspiration for this, in a parallel universe where he never met Ulm and so never became famous, it's Smithy's crop dusting service in its modified Kaydet. The kit is a 1/72 by Revell, with very few parts. The decals, of course, are my home-made ones. 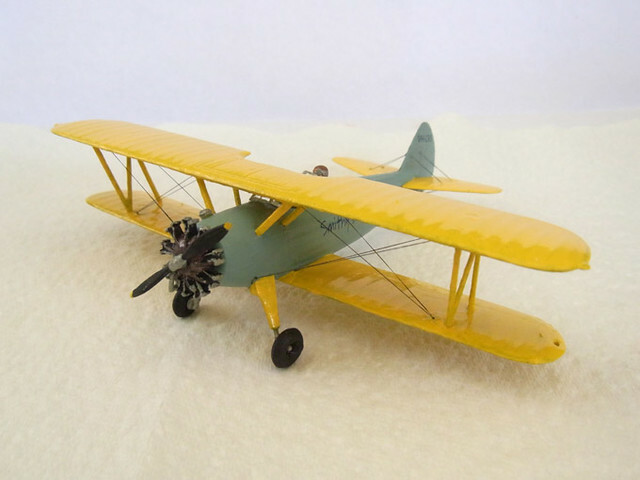 My big breakthrough in this one is that I finally figured out how to do bracing wires for biplanes. Last edited by Ozmac on Sun Jul 02, 2017 7:58 pm, edited 1 time in total. Wire bracing is spot on. That is excellent in every way. Love the back story too. 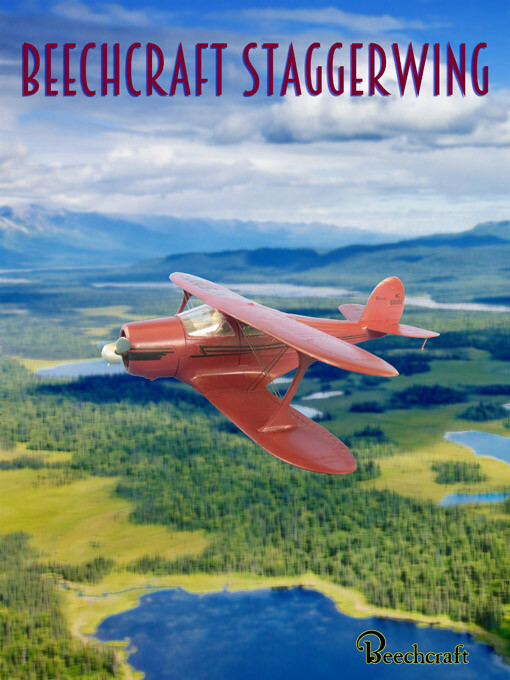 An imaginative story about an unlucky Smith working as a bush pilot. A very talented pilot dreams of crop dusting and obscurity – a reverse Walter Mitty! Or maybe a Twilight Zone episode. Will there be a follow-on movie? After Smithy's nice old cropduster, another plane with a tenuous link to Smithy. This is the plane the famous Australian aviator wanted to buy for the London to Sydney air race of 1934, but he missed out. 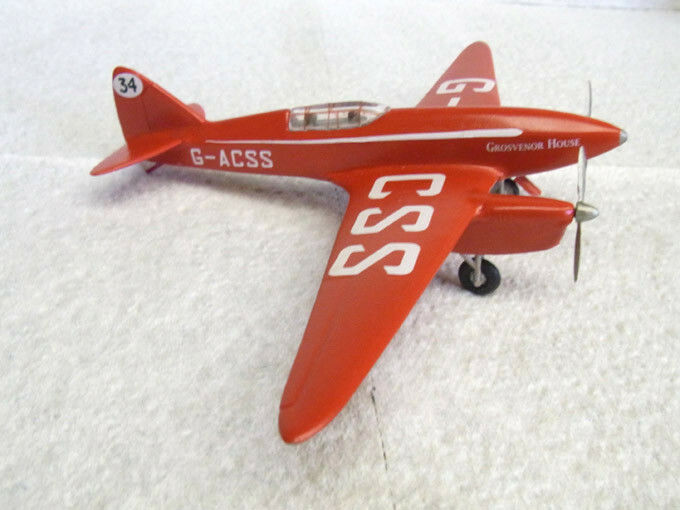 It's the race-winning plane, a De Havilland DH.88 Comet, which completed the flight from London to Sydney in a few hours under three days, which for that era was really flying fast. 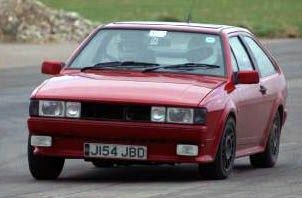 The London to Sydney race was sponsored by a wealthy Australian confectionery manufacturer, MacRobertsons, and the prize money was Fifteen Thousand Pounds, which was a lot of money back then. 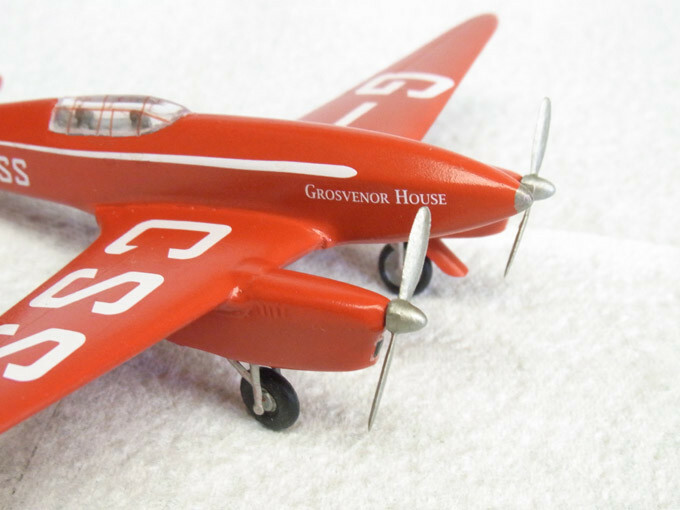 De Havilland advertised that they could build a potential race-winning plane for the race at Five Thousand Pounds apiece, but they'd need firm orders in advance to justify the expense. The orders quickly rolled in. The shape of this 1934 plane is, for its time, state-of-the-art, and it obviously had a huge influence on plane design at the time. Remarkably, the airframe was still mostly built from wood. It featured the new technology of variable pitch propellers, which gave it much better performance all round: greater rate of climb, better top speed, better economy. 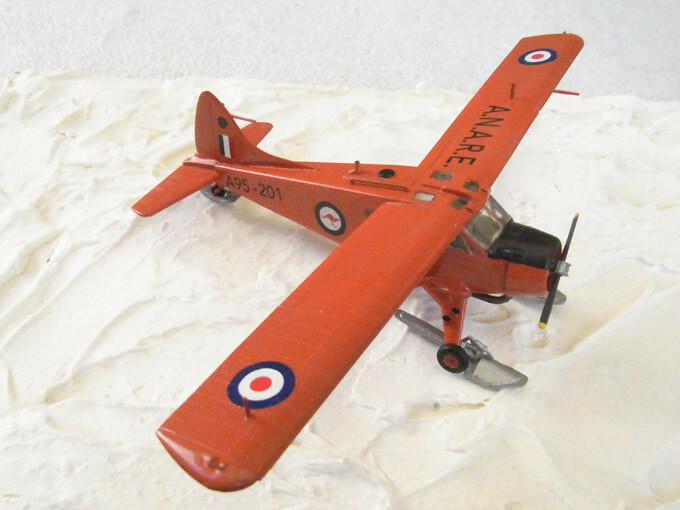 This model is 1/72, an ancient kit by Airfix, with an utterly minimal number of parts. It's actually quite a crummy, ill-fitting kit, not very good at all. "Grosvenor House" was a hotel in England. Two other De Havilland Comets entered the race, one didn't make it to Australia, and the other did, but experienced quite a few problems along the way.